Taste drückt man ums zu sehen welche Linux Kommandos verfügbar sind (im eigenen PATH). Auf meinem Linux System sagt mir die Ausgabe, dass mir 2595 Kommandos in meinem PATH verfügbar sind. Viele dieser „Befehle“ können von Ihrem Lieblings Benutzeroberfläche (z.B. KDE oder Gnome) aus verwendet werden. Sie alle können von der Kommandozeile aus ausgeführt werden. italic = Name einer Datei oder einer Variablen die durch Ihre eigene ersetzt wird. = in-line Linux Kommandos & Filenamen. Linux Groß- und Kleinschreibung. Als Beispiel: Netscape, NETSCAPE sind jeweils drei verschiedene Befehle. Auch meine_datei, meine_datei und meine_datei sind jeweils drei verschiedene Dateien. Ihren Benutzernamen und das Passwort sind auch Groß-und Kleinschreibungs abhängig. Dateinamen können bis zu 256 Zeichen lang sein und Buchstaben als auch Nummern enthalten „.“ (Punkt), „_“ (Unterstrich), „-“ (Bindestrich), plus sowie einige andere nicht erwähnte Zeichen. (list mit der option „all“) um auch diese Dateien zu sehen. Unter Linux werden alle Verzeichnisse in einem einzigen Verzeichnisbaum angezeigt (es gibt keine Laufwerksbuchstaben im DOS-Stil ). In einer Konfigurationsdatei, eine Linie, beginnend mit # ist ein Kommentar. Wechseln Sie in das erste Text-Terminal. Unter Linux können Sie zur gleichen Zeit mehrere (6 in der Standard Einstellung) Terminals eröffnet. Gibt den Namen des Terminals aus in dem sie sich gerade befinden. Wechselt ins GUI terminal (falls X-windows auf ihrem Linux Rechner läuft). 8 bis 12, aber das kann eingestellt werden. (In einem Text Terminal) Vervollständigt automatisch das Kommando falls es einmalig ist, oder zeigt im anderen Fall eine Liste allr anderen Möglichkeiten. Scrollen und die Kommando History editieren. Drücken der <Enter> Taste um den Befehl auszuführen. Scrollen Terminal Ausgabe hoch. Funktioniert auch am login prompt, womit man sich die bootup messages ansehen kann. Modes "1024x768" "800x600" "640x480" "512x384" "480x300" "400x300" "1152x864"
Modes "1024x768" "800x600" "640x480" "512x384" "480x300" "400x300"
server abstürzt und nicht normal beendet werden kann. für einen User auf der text-mode Console. Beendet den aktuellen Prozess (meist im text Modus bei kleinen Programmen). Logt aus dem aktuellen Terminal aus. Stopt den Transfare zum Terminal. be able to see the Befehl as you type it. Verzeichnis to the subVerzeichnis „my_dir“ under my home Verzeichnis. Typing just „cd“ alone is an equivalent of the Befehl „cd ~“. to ausführen die Datei „my_program“ located in your Aktuelles Arbeits Verzeichnis. will Ändert my Aktuelle working Verzeichnis one one level up. Zeigt den Hostnamen (der Linux-Pc auf dem sie arbeiten). Determine the users logged on the machine. Als root to enable „rwho“. Zeigt eine Liste aller User die zu letzt in ihrem System eingeloggt waren. Show the amount of time since the last reboot. (=print status) Listet alle Prozesse auf die aktuell unter dem aktuellen User laufen. terminal, together with the name of the user that owns each process. Manager“ (or by executing „ktop“ in an X-terminal). at the „/“ (root) Verzeichnis (in human legible form). hooks to look at information available to the kernel. List the interrupts in use. Zeigt die Arten der Dateienysteme die momentan in Verwendung sind. Zeigt die Eistellungen der Drucker. are a non-root user.) Show the kernel modules Aktuellely loaded. Show the Aktuelle user environment. Ausgabe der kernel messages (the content of the so-called kernel ring buffer). what „dmesg“ dumped into this file right after the last system bootup. is longer than one screen. Display the contents of the system manual pages (help) on the topic. Display brief info on a bash (shell) build-in Befehl. „dir“ is an alias to ls. Many users have „ls“ to be an alias to „ls –color“. so that the display pauses after each screenful. take you one Verzeichnis up. working Verzeichnis to my home Verzeichnis. mdir, mcd, mren, mmove, mdel, mmd, mrd, mformat …. Erstellt a hard link called destination to the file called source. links to directories or special dateien are impossible. will Entfernt all dateien in my Aktuelle working Verzeichnis, no questions asked. (recursive Entfernt) Entfernt dateien, directories, and their subdirectories. View the content of a text file called „filename“, one page a time. afterwards, you can restore it with the Befehl „reset“. very often „less“ is more convenient than „more“. from the root Verzeichnis „/“. The „filename“ may contain wildcards (*,?). Run an executable in the Aktuelle Verzeichnis, which is not on your PATH. the Aktuelle time. Erstellt an empty file if the file does not exist. Start a barebone X-windows server (without a windows manager). on display 0). You can have several GUI terminals running conAktuellely. can be done by any user). shutdown, simpler to type than the previous Befehl. (Im X terminal) Run netscape (requires a separate Netscape installation). hanged)-it revives when you connect. Zeigt eine html Datei oder surft zur nexten webseite im Text mode. Your Netscape mail will read the mail from your Internet account. is meant to be used in scripts for automation. Ein gutes tex-mode Email Programm. In etwa wie das vorherige Programm. A really basic but extremally useful and fast mail reader. for a better e-mail reader. an e-mail from a shell script. download one and install it. you type goes in open text, even your password! from your Aktuelle session is used; if it fails you are prompted for a password. are prompted for a password. Minicom Programm (sieht in etwa aus wie „Procomm for Linux“). *.tgz) that you downloaded from the Internet. Untar a tarred aber nicht gepackten tarball (*.tar).
) if you wanted to comDrücken dateien to this file format. Extract the content of an *.arj archive. any file into an ASCII file). users or without a controlling terminal), each with the name of the owner. Use „top“ to keep listing the processes Aktuellely running. Bring a background or stopped process to the foreground. twice in row to log out. proceeding Befehl in the background“). the system load is low. I can logout, and the process will keep running. the Befehl(s) to run, until you Drücken <Ctrl>d. use GUI-based „Printer Queue“ available from „K“menu-Utilities. Entfernt a printing job „job_number“ from the queue. (of „niceness“ to other users on the system), the higher the priority. negative values. Use „top“ to display the priorities of the running processes. also belong to this chapter but they were described previously. to the background, stop the data transfer, resume the data transfer. (Als root) Configure mouse, soundcard, keyboard, X-windows, system services. at the same time, and be careful with changing entries you don’t understand. Erstellt an alias for the Befehl „ls“ to enhance its format with color. alone to see the list of aliases on your system. Don’t forget to set up the password for the new user in the next step. have to decide what to do with the dateien). on a home machine with a small number of users. after you copy a file for use by somebody else. any other user identity, e.g. (password required unless I am a superuser). for this feature at all). here shows the standard setting for the first serial port (cua0 or ttyS0). the boot time. See man setserial for good a overview. kernel options in preparation for compilation of your customized kernel. the new kernel. You will probably also find it useful to read „man depmode“. but it CAN lead to problems if you don’t know what you are doing. you will most likely receive the „signal 11“ error. “ to load the modules. mode device). The two integers specify the major and the minor device number. of a floppy in the first floppy drive (/dev/fd0), high density (1440 kB). ). Making the dateien system is an equivalent to the high-level format. are to be checked. This Befehl does not modify the floppy. uses the partition hda2, dateienystem type ext2. (file) to another floppy disk. Works like DOS „DISKCOPY“. info on what happened. Keep reading if you prefer a GUI installation. filename (on your hardrive) belongs. (=RedhatPackageManager, erase=uninstall.) Uninstall a package pagckagename. them if you want (installation must be done Als root). Mounting drives. Examples are shown in the next Befehls. exist, be empty and NOT be your Aktuelle Verzeichnis. you might not be able to unmount a drive that you didn’t mount. (Als root) A very good menu-driven setup of your network. IP), Drücken <Ctrl>C when done (it keeps going). IP number) host_to_find. This way you can check if your DNS works. (which is either a host name or IP number).
) to configure the interfaces. to it run as a user) Startup a network interface. Also, see the previous Befehl. Spielt eine wave Datei ab. Spielt eine mp3 Datei ab. Erstellt a wave audio file from an mp3 audio file. users of napster have displayed for downloading. Really cool! Spielt eine midi Datei ab. will display text mode effects on the screen. for the same end effect. (in X terminal) A humble looking but very powerful image processor. (in X terminal) Mächtiger Foto Editor. Convert the propriatory giff graphics into a raw, portable pnm file. of being sued by the owner of giff patents). When you copy a DOS file to Unix, you could find rn in the end of each line. 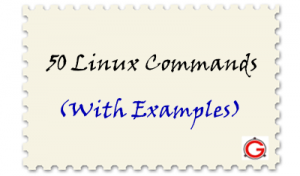 This example converts the DOS file format to Unix file format using sed command. $ export | grep ORACLE declare -x ORACLE_BASE="/u01/app/oracle" declare -x ORACLE_HOME="/u01/app/oracle/product/10.2.0" declare -x ORACLE_SID="med" declare -x ORACLE_TERM="xterm"
Check the status of all the services. chown command is used to change the owner and group of a file. # date -s "01/31/2010 23:59:53"
Linux provides several powerful administrative tools and utilities which will help you to manage your systems effectively. If you don’t know what these tools are and how to use them, you could be spending lot of time trying to perform even the basic administrative tasks. The focus of this course is to help you understand system administration tools, which will help you to become an effective Linux system administrator. 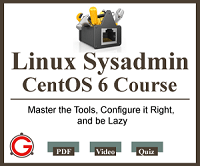 Get the Linux Sysadmin Course Now!